This isn’t something you would want to feed your birds a large amount of everyday, but it can certainly be a healthy treat! Soak the sunflower & pumpkin seeds for 8 hours, drain. Grind the flax seeds & sesame seeds (I use a chopping attachment for a hand blender, but you can also use a coffee grinder that’s never been used for coffee). Soak the ground flax & whole chia seeds in 3 cups of water for 30 minutes. 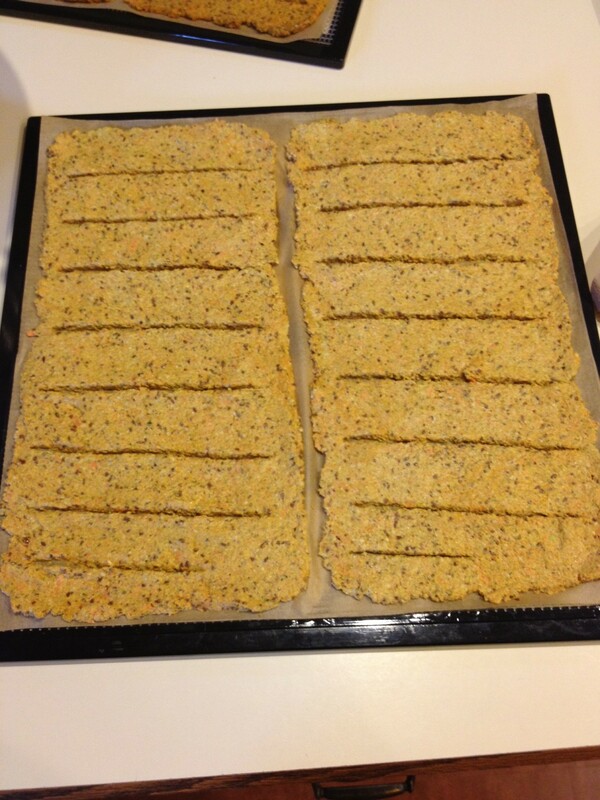 Spread onto parchment paper lined dehydrator trays. Scoring the trail mix treat will help it dehydrate faster and make it easier to break it into squares. Dehydrate for 2 hours at 155 degrees, then reduce temp to 110 degrees. Dehydrate for up to another 22 hours. Flipping the trail mix treat after the first 8-12 hours of dehydrating and removing the parchment paper will help it dry more thoroughly. I’m a big fan of a whole foods sprout based chop style diet with supplements. If a chop style diet works for your birds, then stick with it! However, dehydrating that same diet could be a convenient way for your birdsitter to feed your birds when you’re away from home. 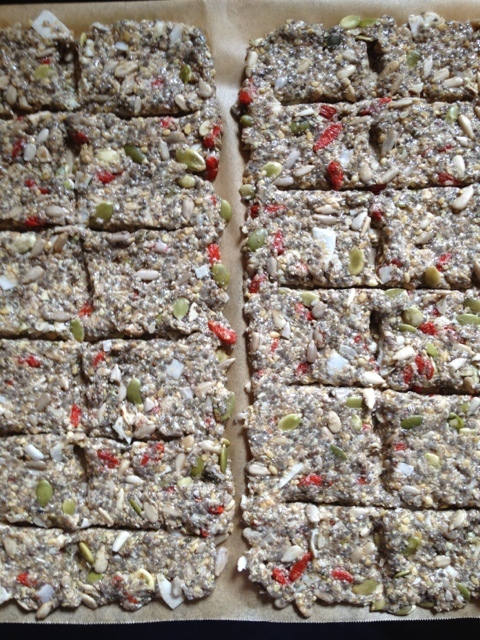 Or you might just want to use dehydrating as a way to provide healthy treats for your birds. Or you can serve an occasional meal of dehydrated birdfood in the morning that will be safe in the cage all day long if you know you won’t be home to serve birdie dinner on time. Dehydrated foods can be both nutritious for your bird and convenient for you. The recipes on this site are meant to serve as examples for someone new to dehydrating to go by. When I make dehydrated food I don’t actually follow a recipe, but I do sometimes jot down the ingredients in case I want to make something similar in the future. My recipes may be a good place to start if you are unsure of what your bird will like. 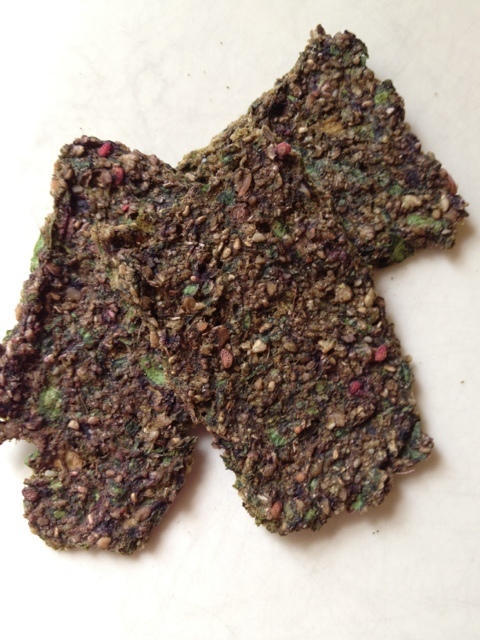 Anyone making dehydrated birdfood should feel free to experiment with recipes and customize the ingredients and flavors for their birds. None of these recipes on my site represent a complete diet. 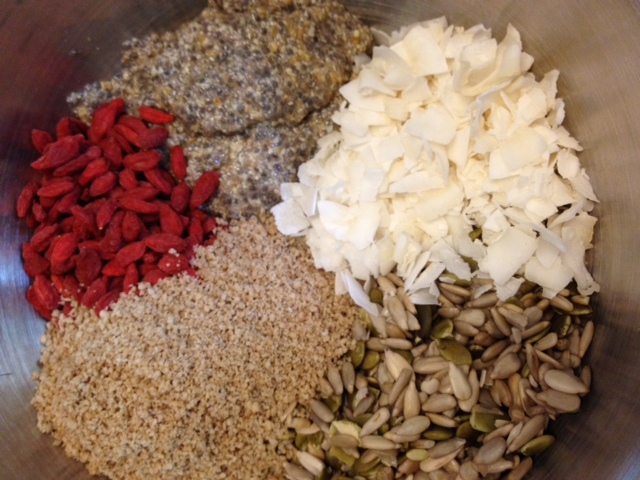 I use the dehydrated foods as a convenient means for getting my birds to eat some of the fresh, whole foods that they won’t always consume on their own. You notice I don’t include foods such as nuts or apples in my recipes, because my birds voluntarily eat as much of these as I will serve them. Yet the kale based crackers shown above include other nutritious vegetables, berries, sprouts, spices and herbs mixed in and they are readily consumed by my birds. Because none of the meal recipes on my site are nutritionally complete, I suggest only using them as occasional meals. Ensuring your bird has a well rounded diet that covers all the nutritional bases is important and using any of these recipes as a large a portion of the diet will make that more difficult. When serving dehydrated food as an occasional meal, you might want to weigh out each portion. 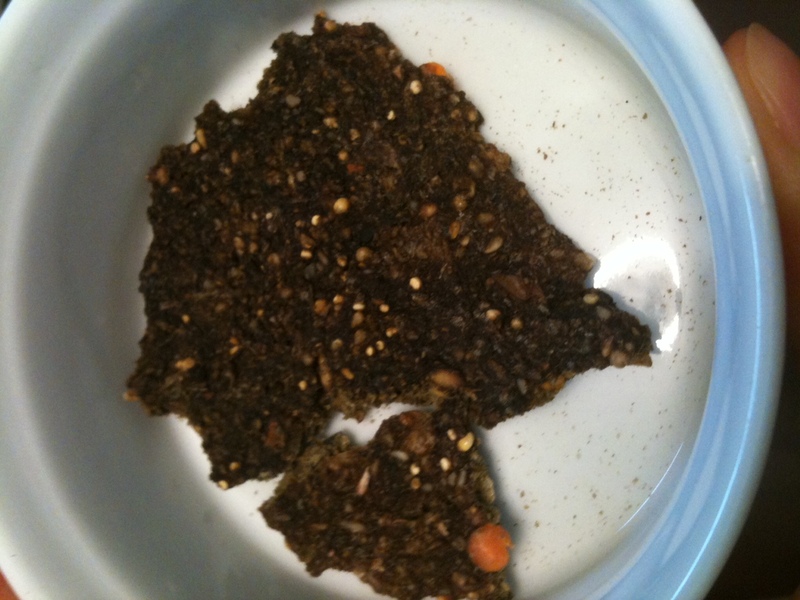 The dehydrated food can vary in thickness and just eyeballing it hasn’t worked as well for me. Below are the amounts I use for a single serving. Since each bird is an individual and things like activity level will affect how much a bird eats, you should use these amounts only as a guideline. Start with a few grams more than what I have listed below, because you don’t want your birds going hungry until you’ve determined the right amount to feed them. It doesn’t seem like much food when you put it in the bowl! But remember that all of the moisture has been removed and that greatly decreases the weight. When I feed a mash or chop meal I’m usually feeding at least double these weights. 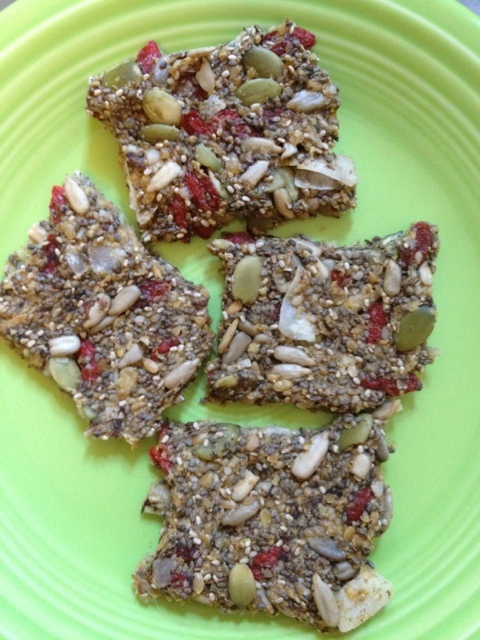 It’s easy and fun to make dehydrated treats and snacks for your bird! You should experiment with recipes that help you sneak lots of nutrition into each batch. Just remember that these treats and snacks should be served in limited amounts and make up only a small portion (5% or less) of the daily food intake. This was a big hit with our birds! While no two batches of birdfood have ever been exactly the same, we keep coming back to this recipe to make something similar since the birds liked it so much. Having dehydrated food on hand can make for an occasional easy meal replacement. 7 cups soaked sprouts (grains, seeds, lentils & mung beans). Start with about 4 cups of dry sprouts and soak overnight to get the 7 cups for this recipe. Of the first three ingredients use the lower amount for birds who need less fat in their diet. Reserve 1/4 cup or so of sprouts to stir in whole to make the food look more appealing. Grind all other ingredients in the food processor. Mix everything together and stir in the reserved whole sprouts and stevia. 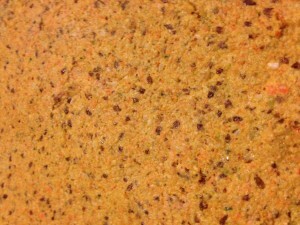 Spread onto dehydrator sheets at about 1/4 – 1/3 inch thick. Scoring the food will help it dry more thoroughly. Dehydrate for up to 24 hours, flipping the food after about 8 hours. 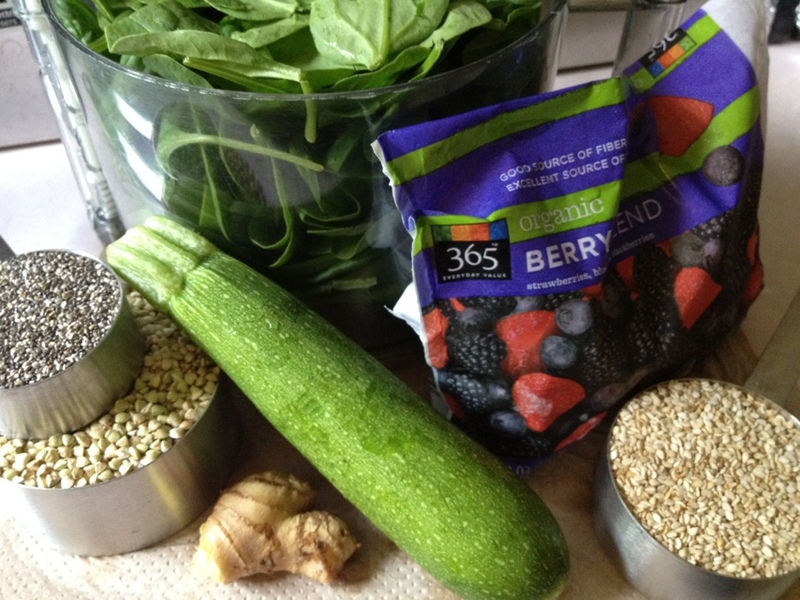 This recipe will fill the 5 tray excalibur dehydrator. Our birds have almost finished up the first batch of these. For the next batch I will be adding a small amount of beets or blueberries to add some color. The birds didn’t seem to notice that these breadsticks look a bit plain, but a little color would help jazz them up a bit. Rinse and soak buckwheat and sesame for 30 minutes, drain. Put all ingredients except chia in a food processor until a dough or very thick batter forms. You can add very small amounts of water if needed to process. Stir in the chia seeds whole and allow the mixture to thicken until it’s the consistency of dough. For breadsticks: Use your palms to roll out a portion of dough (like making a snake with play dough – cooking can be fun!). Lay these “snakes” on the parchment paper lined dehydrator trays and smoosh them flat with your fingers. You want them to be about 1/4 to 1/3 inch thick. For cookies: Use your palms to roll a tablespoon portion of dough into a ball, then flatten the balls onto the parchment paper lined dehydrator trays until they are about 1/4 to 1/3 inch thick. Dehydrate for 8-12 hours, then flip and dehydrate up to a full 24 hours total. You can make just about any flavor with this recipe. This can also be a good recipe for experimenting with different flavors to see what your bird enjoys most. 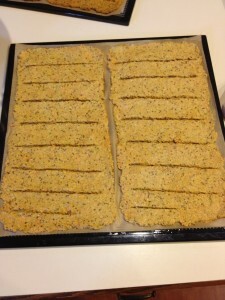 You can even add small seeds on top of the breadsticks or a piece of almond on top of the cookies. These treats are far from being nutritionally complete, but they are certainly healthy enough that your bird can have a small amount each day. The chia seeds are full of antioxidants and omega-3. The in-hull sesame seeds add extra calcium. Some general info you might find helpful if you’re considering dehydrating for your birds. The information about the actual process of dehydrating and storage is on the conservative side, but these are the guidelines I follow for my own birds. There are lots of dehydrators on the market, but the Excalibur has long been a favorite of raw food fans. We have both the 5 tray and the 4 tray model and have been very pleased with them. Don’t worry about following the recipes exactly. The most important part is the spices & flavorings. 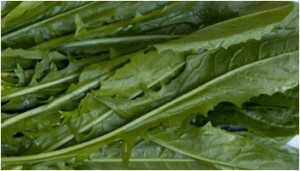 These make the healthy foods more palatable, like masking the bitterness of greens. Feel free to add your usual supplements to the recipes if you will be using the food as an occasional meal. We generally grind everything up. The best method we’ve found for grinding dry seeds and grains is in a chopping attachment for our hand blender, but an unused coffee grinder works as well. Everything else goes through the food processor. Small seeds like amaranth or quinoa can be added whole. One large batch of food (enough to fill the 5 tray Excalibur) takes about 1 – 1.5 hours to get ground up & spread out on the trays. We always use parchment paper on the dehydrator trays as this makes for super easy clean up. We use the back of a large serving spoon to help spread out food on the trays. If you live in a humid area, try dividing the food up into two or more sections on the dehydrator tray, then score it help it dry more evenly. The scoring can be done with a butter knife. The general rule is that food can be dehydrated for up to 24 hours. Dehydrating at temperatures below 110 degrees will help ensure beneficial enzymes remain intact. To speed up the drying process, you can dehydrate for the first 2 hours at 155 degrees and then decrease the temp to 110 degrees. The moisture in the food keeps the food from reaching the higher temperatures during those first 2 hours. We always flip the food about half way through the dehydrating time and remove the parchment paper at this time to speed up the drying process. When the food is completely dry or you’ve been dehydrating for up to 24 hours, turn off the dehydrator and allow the food to come up to room temperature. This can take up to an hour, but don’t let the food sit longer than that. Be sure to check for dryness by breaking the food up into smaller pieces before storing it. You should be able to tell if an area isn’t completely dry and this food needs to be stored separately from the dry food. Food that has been thoroughly dried can be stored in an air tight container away from light at room temperature for up to 3 weeks. Any food that isn’t completely dry can be stored in the fridge to be served within a few days or in the freezer for up to a couple months. Be sure to always indicate the date on the containers you store your food in. Our greys loved the Spicy Indian Crackers we made, but my umbrella cockatoo didn’t care for them. This was the first time he’d ever turned up his beak at something I had dehydrated! They must have a bit too much heat for his taste. So I found myself needing a simple recipe that I could whip up after work one evening. This is certainly not the most complete or nutritious of meals, but it is quick and easy. Since it’s whole foods, it’s healthier than other convenience diets while still being just as convenient to serve as an occasional meal. Grind the buckwheat, sesame, flax and/or chia seeds (I use the chopper attachment on a hand blender, but you can also use a coffee grinder that’s never been used for coffee). Run all the other ingredients through the food processor. 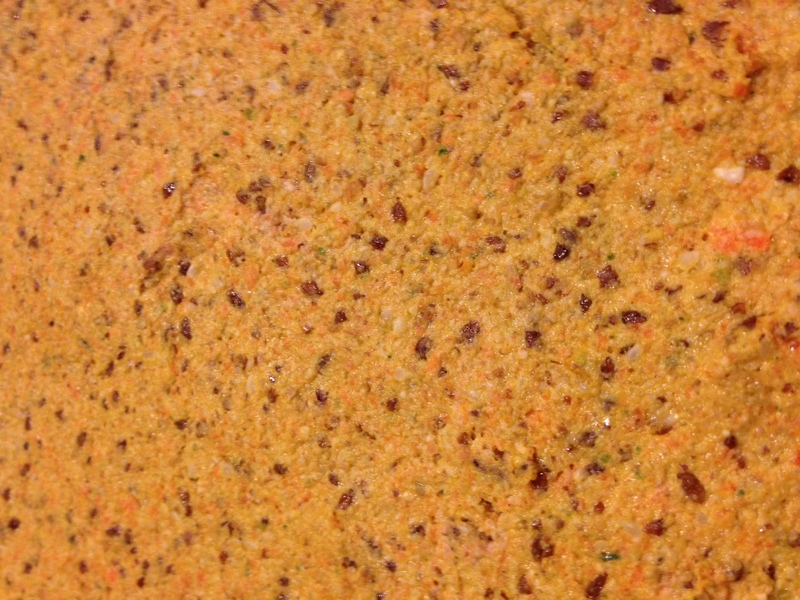 Mix everything together and spread approximately 1/8 inch thick onto parchment paper lined dehydrator trays. Scoring will help it dehydrate faster. Dehydrate for 2 hours at 155 degrees, then reduce the temp to 110 degrees and continue to dehydrate for up to another 22 hours. Flip after the first 8-12 hours of dehydrating and remove the parchment paper to help it dry more thoroughly. Makes approx 2.5 sq feet of dehydrated food or enough to serve my umbrella cockatoo about 20 individual meals. We felt like we needed to serve something totally different than our usual greens based crackers. 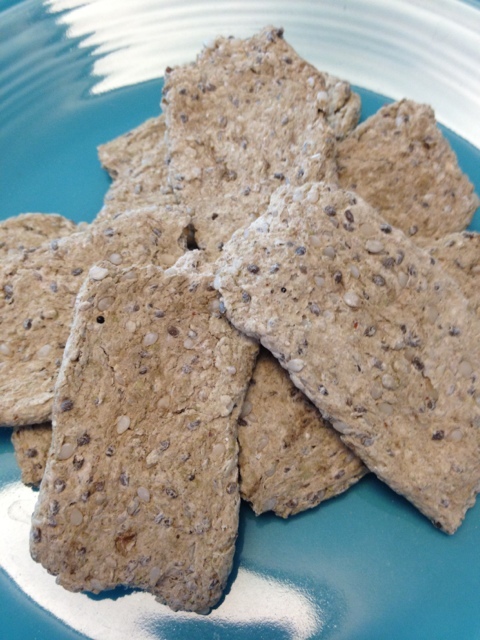 We were inspired by Brad’s Raw Indian Crackers though we changed up the ingredients some so they would be better suited for birds. These crackers can occasionally be fed as a single meal in place of a bird’s regular diet. Grind the flax and sesame seeds in a hand-blender chopper attachment or coffee grinder. Put all other ingredients in the food processor. Mix everything together in a bowl. For visual appeal we added a small amount of whole flax and a couple handfuls of shredded carrot. 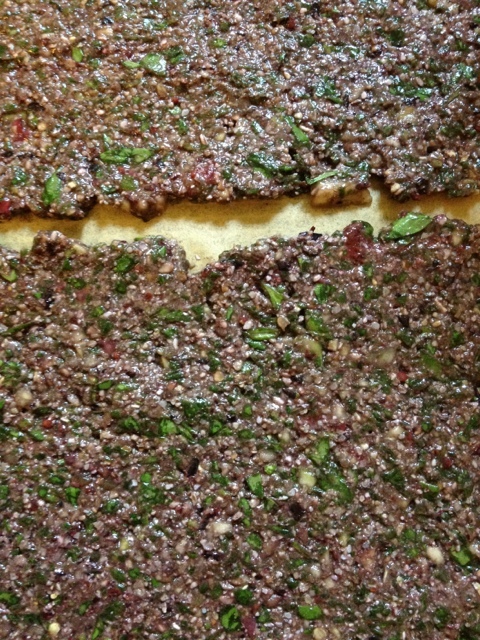 Spread onto parchment paper lined dehydrator trays at about 1/4 – 1/3 inch thick. Score the food to help it dry more evenly. Dehydrate for up to 24 hours, flipping the food after about 8 hours. 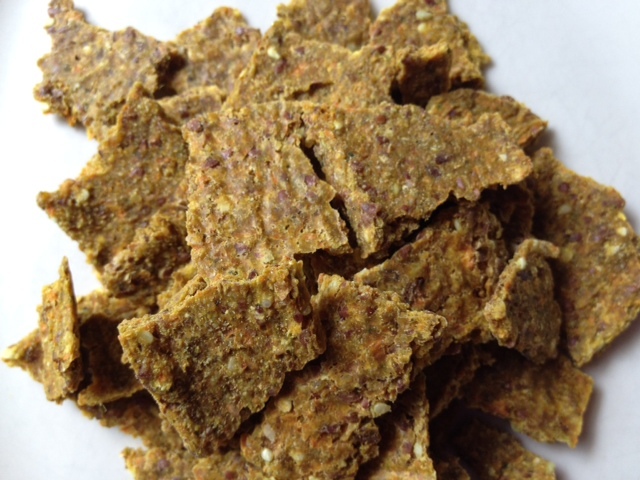 This recipe will fill the 5 tray Excalibur dehydrator. Please note: The Spicy Indian Crackers were liked by all 3 greys and my blue crown conure. However, my umbrella cockatoo doesn’t care for them. This is the first time one of our birds hasn’t enjoyed what we’ve made. We’ve made other recipes with jalapeno and the above spices, but I think we made this batch overall a bit too hot and spicy for his taste. Go easy on the above spices if you’re not sure how well your birds like them. Dehydrating can be especially helpful if your bird has an illness or condition that would benefit from the addition of certain foods, supplements, or herbs to their diet. Recently on the EssentialBird Group we were discussing adding dandelion greens to the diet of a bird with kidney problems. Below is a sample recipe that might be useful if a bird won’t consume dandelion greens whole. 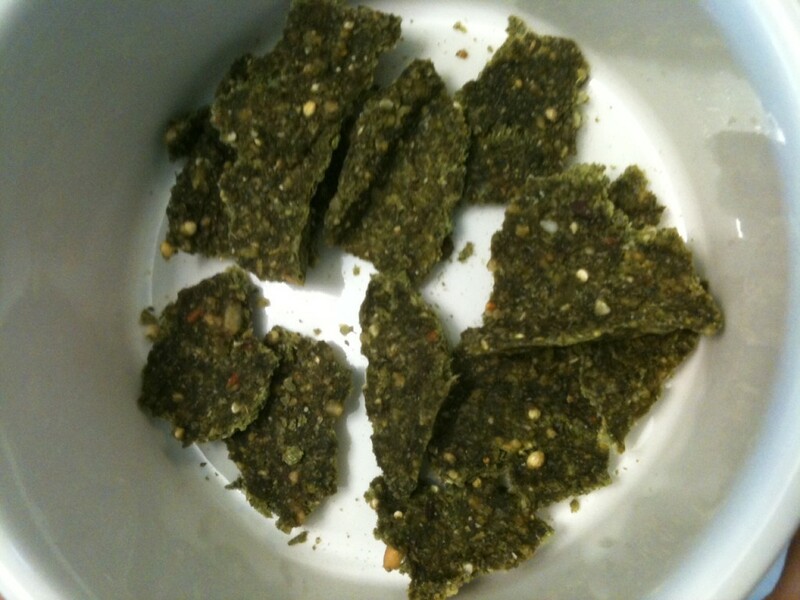 Enough green powdered stevia herb to make it taste just barely sweet to you. This will help mask the bitterness of the greens. This same idea can be used for any herbs or foods that will be beneficial for your bird. Most birds seem to readily eat crackers and serving your bird their supplements in this way makes it more like a treat than medicine. Berries are the healthiest of fruits and this recipe can be especially useful for birds (like my umbrella cockatoo) who won’t eat their berries! Puree the berries and ginger. Mix in chia seeds and allow to sit for 30 minutes so the mixture will thicken. 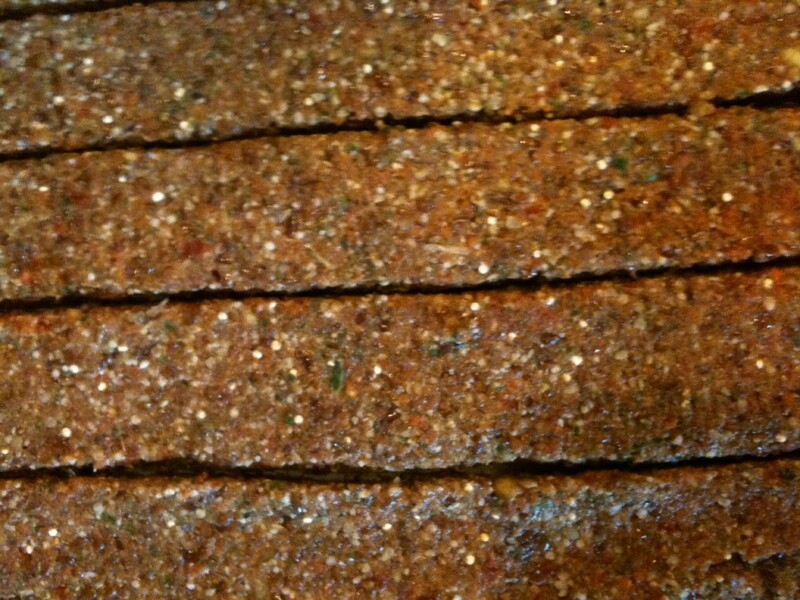 Line dehydrator trays with parchment paper and spread the mixture very thin onto the parchment paper. Dehydrate for 6-12 hours. Cut the fruit leather into small birdie sized pieces or get creative and cut it into strips, roll it up, and secure it with string, raffia or a toothpick. This is one of the first recipes we made and is fairly simple. It’s a great recipe for birds who won’t eat whole carrots or kale! My birds love all the spices. This recipe can be used as a treat or as an occasional meal. Run everything through the food processor. The millet will likely stay whole and this is fine as it makes the food more visually appealing. 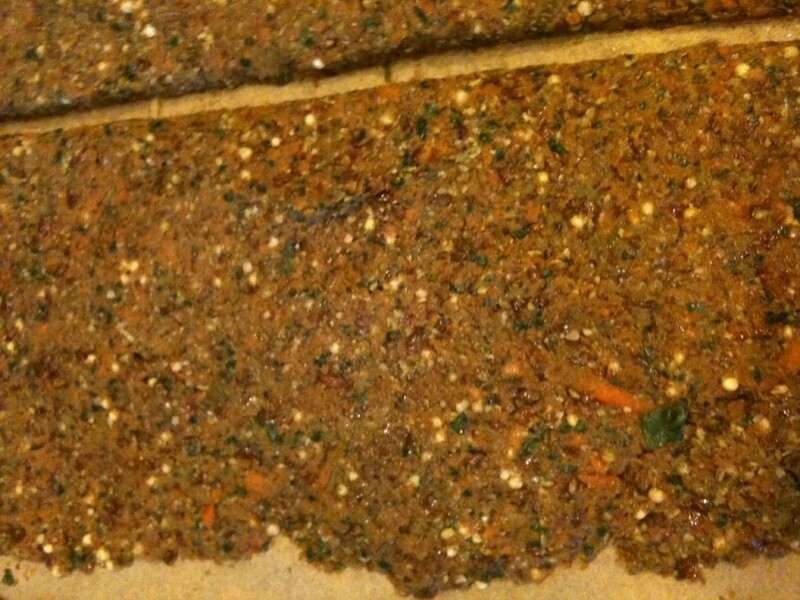 Spread the mixture 1/4 inch thin onto parchment paper lined dehydrator trays. 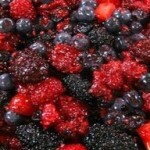 This recipe will fill a 5 tray Excalibur dehydrator. Dehydrate at 155 for 1-2 hours, then at 110 for up to another 22 hours.